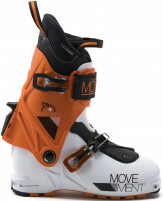 Based in Switzerland, Movement is a relative newcomer to the impressive array of European ski companies. They've progressed farther than most, however, using advanced carbon fiber technologies to achieve some of the best strength-to-weight ratios on the market. The Movement Alp Tracks skis consistently outperform the competition. The Race Pro is Movement’s podium contender that combines the race-pedigree of the former Rise-X Pro ski with the performance and handling capabilities of the trusted Fish-X series. Using the patented North TPT wrapping process, the Swiss engineers introd..
We’ve heard it described as the perfect ski. We think that may not be an overstatement for a certain class of skier. We’re not sure if this is a race ski you can tour on, or a touring ski you can race on, but we do know it is uniquely amazing. It could be.. The new Gold Fish, aka perfect weapon. Known for producing some of the highest-performing skis atop the surface-area-to-weight charts, Movement has endeared themselves to skiers who demand premium gear. As the name would suggest, the Race Pro 71 is 71mm w..
As the successor to the Big Fish, The Race Pro 77 is the girthiest option in Movement’s Race Pro lineup, yet still has a head-scratching light weight. The Race Pro 77 is a full-blown mountaineering, corn-hunting, couloir-skiing tool that weighs less than .. The Women’s version of the Alp Tracks 84 uses a slightly different mix of carbon fibers to adapt the flex to female skiers. Not quite as stiff, the ski is still light, damp, and reliable. Movement’s most advanced construction process is labor intensive, i.. The 84 is the mountaineering specialty ski of the Movement Alp Tracks line. Using the same advanced construction techniques found in the 94, 100, and 106, this steep skiing weapon is built to perform on the up and the down. Amazingly lightweight yet stabl.. 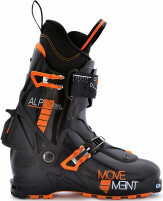 The Alp Tracks 85 is Movement's specialty tool for the ever-changing game of ski-mountaineering. The ski is designed for those longer, steeper, and faster missions. Every Alp Tracks ski is handmade using an advanced carbon/karuba layup to keep the weight .. The Alp Tracks 85 Women is that high-performance tool to get you farther and higher than ever. Movement has continued to hone their mid-80s underfoot line and with each iteration they get closer to the perfect tool for big ski objectives. All of the Alp T..
Movement’s Alp Tracks line has been the go-to for skiers that want a high-performance ski at a silly light weight. Now available in the “goldilocks” size, the Alp Tracks 89 is Movement’s way of contending for a one-ski-quiver. With enough tip rocker to do..
As the true all-mountain width in the Alp Tracks line, the 94 is a daily touring machine. With a crazy light yet robust construction, the AT series of skis are sure to gain some converts to the Swiss ski movement. The Alp Tracks 94 is part of a limited ha.. Versatility, easy and quick turning, excellent edge grip. Those were the primary concerns when developing the Apex ski. If you’re looking to charge in difficult terrain, but don’t want a huge weight penalty, the Movement Apex could be for you. The light t.. Wide, ample rocker, generous power, and somehow still light enough to skin back up again and again. Movement’s Control ski sports Light Rocker 12, providing flotation in challenging terrain while not reducing stability in hard snow at speed. ABS Sidewalls.. The Movement Session 98 is not a ski that will stay shelved for long. Designed for high-performance skiers looking to push bigger, steeper, and faster, the Session 98 is a free-touring ski that will more than satisfy. With a light Karuba core and a 5-axis..
Alp Tracks is a limited ski series from Movement that requires a manual finishing process that squeezes fiber layers together to reduce weight. Never before has a 100mm wide ski been made this light and robust. The skis are lined with a mini-ABS sidewall ..
With the Alp Tracks line, Movement has levelled up in their quest for the perfect lightweight backcountry skis. 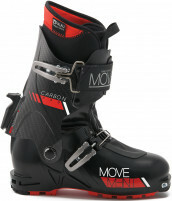 Using a labor-intensive carbon fiber construction process, the Swiss company has managed to make skis much wider than their previously top-end ..
With its speed-focused design, the Movement Carbon Pro Boot will certainly get you to places quickly. The boots are equally honed for ski-mountaineering racers and tourers who think time is precious. A specially-designed, full-carbon cuff gives a PRO flex..
It’s fitting that some of the fastest skis on the block have some of the fastest skins available as part of a matching kit. The Colltex PDG is a fan favorite because of its astonishing gliding power and the ability to retain grip while others are slipping..
Movement’s skis are admirable performers in dangerous terrain. But without the proper skin to get you there, said terrain is even more dangerous. Colltex’s track record and favoritism among alpinists made Movement’s choice of skin-manufacturer simple. The..
Drape your Movement Race Pro skis in Pomoca pink! The Swiss ski manufacturer has teamed up with the Swiss skin manufacturer to make the sexiest ultralight skis on the planet. The Race Pro series is available in “oversized” 71mm, 77mm, and 85mm widths with..
A triple-certified helmet that fits well and looks good! 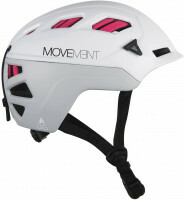 The Movement 3Tech Alpi has alpine-skiing, mountaineering, and biking certifications to meet European and International safety standards. It’s even certified under the American body (ASTM). 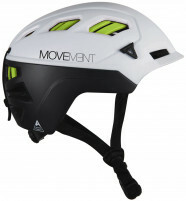 The only..
Movement’s 3Tech Alpi is a racing and touring helmet that has alpine skiing, mountaineering, and biking certifications. Yes, triple certified for triple the pleasure! More surprising than being certified for basically any outdoor activity is how Movement .. 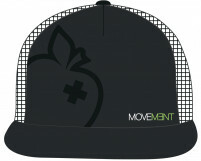 The Movement Ball Cap was developed with Movement lovers in mind. If you have Movement skis, aspire to ski on Movement skis, or just think Movement skis are cool, then this hat has your name on it. Literally, we’ll write your name on it before we ship if .. If you can't make it to the mountains, you can still represent this amazing Swiss ski company. 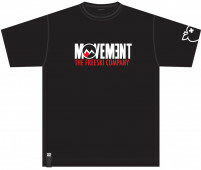 Movement makes a variety of tees that are sure to attract attention. Look good skiing fast or standing around. Sizing is fairly typical for a T-Shirt. 100% cott.. The photo makes it looks more like a purse, but it’s a ski bag! The Movement Alp Tracks ski bag unzips and becomes a full-length case made of ripstop nylon. Slip in your Alp Tracks skis and jet off to whiter pastures. When you’re home, zip it back up into..